As explained by the Fiber Optics Association, fiber optics is the communications medium that sends optical signals down hair-thin strands of extremely pure glass cores. The core is surrounded by the cladding that traps the light in the core. Fiber types are identified by the diameters of the core and cladding, expressed in microns. 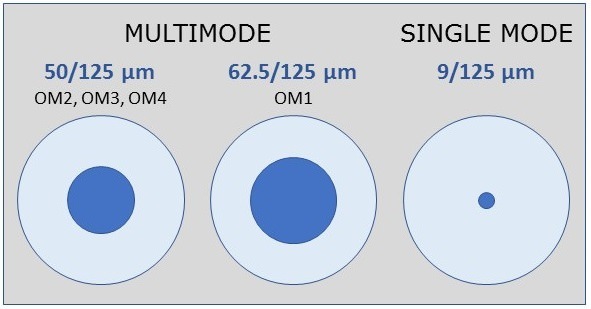 Multimode fiber is available in two sizes, 62.5 or 50 microns, and four classifications: OM1 (62.5/125 µm), OM2, OM3, OM4 (50/125 µm). The diameter of a single mode core is 9µm. Both fiber types have a cladding diameter of 125 µm or microns. Light travels through a large core in many rays called modes (multiple modes). Due to refraction, the rays are reflected from the cladding surface back into the core as they move through the fiber. 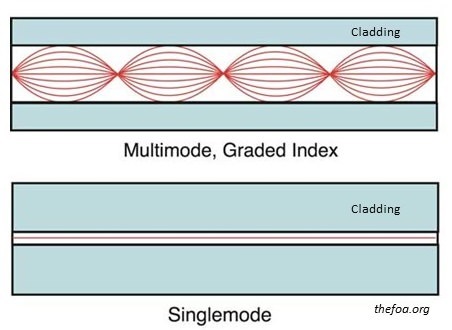 Single mode fiber has a much smaller core which forces the light to travel in one ray or mode (a single mode) with little light reflection so the signal will travel further. Your application requirements determine which mode you use. Refer to the chart below for a comparison of the two modes.